← Project Management 2.0 – Was it really about Project Management? Communications planning on projects takes up a major part of the PMBOK. Because traditional project management is based upon a philosophy of control, project managers are advised to develop and maintain a detailed project communications plan, with important formal communications defined and agreed to by project stakeholders. Having been involved in scores of projects as a project manager, we have prepared literally thousands of informal and formal communications for stakeholders. However, how many times when we were writing those communications did we think that the stakeholders really valued that information, and that they would really take (have) the time to understand the communications. Rather, we knew that when something was really important (an exception), we would have to call it out with a special communication, that probably was not defined on the project communications plan. Basically, as Fred Brooks pointed out in The Mythical Man Month, adding people to a project creates more theoretical communications paths, and therefore more potential communications complexity. 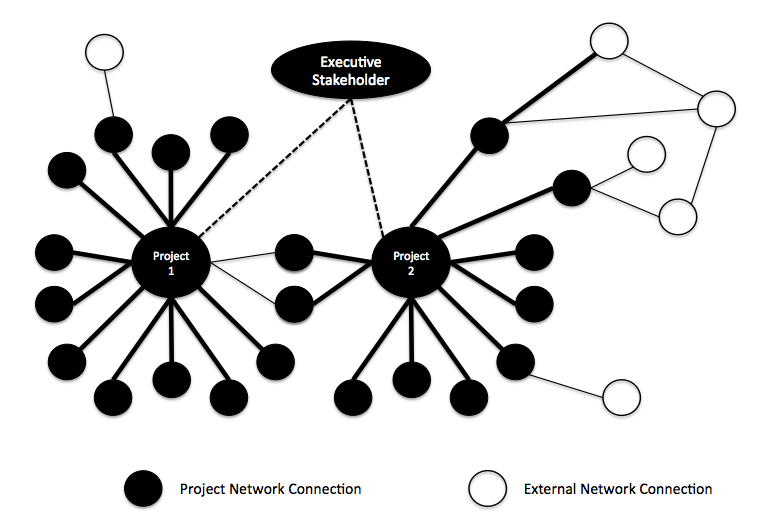 Because teams are large and, because the communications challenges within distributed and cross-cultural teams are real, communications control led to the partitioning of communications, with the project manager or several project managers becoming communications hubs, responsible for the filtering and distribution of information in order to limit the complexity of communications across the team, and to attempt to reduce information overload see this article. Rather than viewing the project as a set of communications paths between individuals (“peer-to-peer” communications), social project management creates the concept of communicating between individuals and the project (we call this “peer-to-project” communication). While project team members will, of course, communicate one on one as necessary, applying the “Facebook” or “Tweet” paradigm to a project, creates a steady stream of information to the project, and from the project to the individuals. Rather than having to maintain one communications path with every member of a project team, each member only has to maintain one communications path with each project, and then specific communications paths as necessary. However, if the peer-to-peer communications paths happen outside the project, the rest of the project team is unaware of the communications. Whereas in a collocated team environment, much of this informal human-to-human interaction is processed by individuals as part of the environment, in distributed teams this communication must be made visible through the collaboration system. As much as possible, social project management encourages the use of the system for peer-to-peer AND peer-to-project communications, creating the maximum ambient awareness for the team. Conceptualizing the addition of a new project member as a new set of communications paths between each member of the project, we can conceptualize the addition of a new project manager as a simply a new peer-to-project path. This new path does not change the other peer-to-project communications, it simply adds another potential source to the communications paths. Additionally, notice from the diagram that social project management, because it is embedded into the collaboration network of the organization, enables the seamless integration of external network contacts via the social networks of project members. In a sense, peer-to-project communication with social project management is a publish-subscribe model for project communications. While this concept is somewhat silly when describing collocated teams, it is very applicable to technology-enabled teams. This publish-subscribe + tweet paradigm, where the external social network can be seamlessly integrated into the management of exceptions makes project management social. This entry was posted in General, Social Business, Uncategorized. Bookmark the permalink.